Nursing home negligence in Missouri and other states has become a pervasive issue that society must now confront. The longer society continues to disregard the implementation of stringent professional standards in nursing homes, the more elderly individuals will be harmed every year. In Missouri, research statistics show that over 26 percent of nursing homes dispense unnecessary drugs to residents. These unnecessary drugs are known as “chemical restraints,” and they are often used to control the behavior of nursing home residents. Residents become more sedate, and their movement is also restricted. 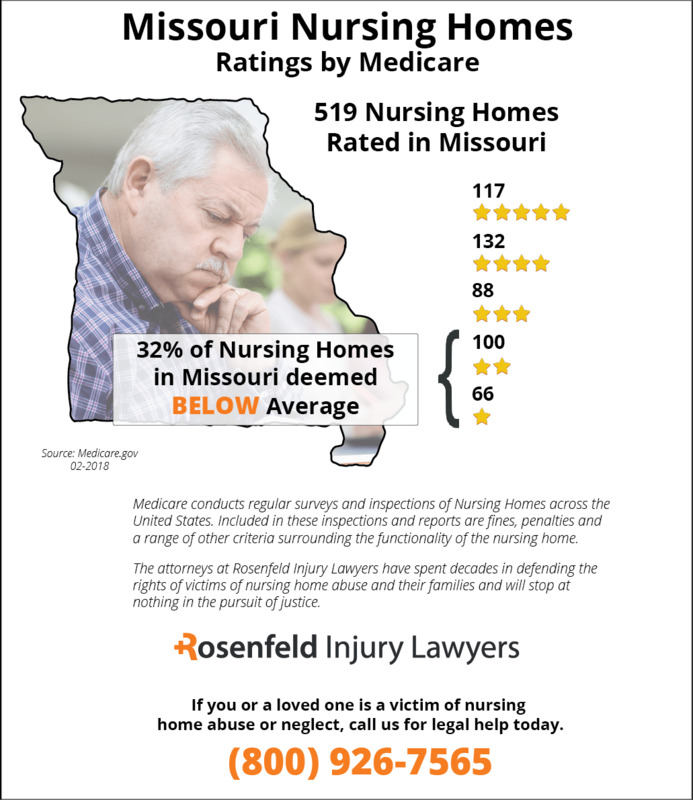 Throughout the year, Medicare gathers information from surveys, investigations and inspections on every Missouri nursing home identify with deficiencies and violations. According to the federal agency, 164 (32%) of the 519 nursing facilities rated in Missouri are deemed below average compared to national statistics after investigators identified severe violations the deficient. 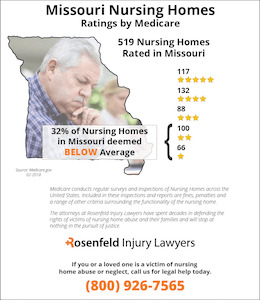 If your loved one was injured, neglected, abused, mistreated or died unexpectedly while residing in a nursing facility in Missouri, contact the Missouri nursing home abuse & neglect attorneys at Nursing Home Law Center today to discuss a compensation claim during a free case evaluation. Under federal law, the use of unnecessary drugs is clearly prohibited as a form of abuse. Missouri nursing homes also have problems in maintaining a safe atmosphere for residents. Over 37 percent of nursing homes were cited for deficiencies in 2008 for failing to maintain a safe atmosphere. Family members must be cautious when choosing nursing home facilities for their loved ones, because the statistics show that abuse and neglect are continual problems in Missouri every year. With the numerous federal and state nursing home injury laws in place to protect loved ones, one would assume that nursing homes actually followed these laws. Unfortunately, nursing home administrators frequently feel that they can “get around” the laws in failing to hire an adequate number of staff workers. The Nursing Home Reform Act of 1987 is the major piece of legislation that stated the rights of all residents in nursing homes and also maintained the standards that nursing home must meet. Nursing home residents must be provided with certain services to ensure their physical, emotional and mental well-being. When a nursing home attempts to hire too few workers or an improperly trained staff, then residents are the ones who suffer and forego those services that they need to receive quality care. Family members can learn more about the rights of elders in Missouri by reading the Protective Services for Adults: Elder Abuse Act. This statute creates certain departments in the state government that have the authority to handle allegations of abuse and investigate reports. Missouri nursing home laws are distinguished from other states, because professionals and family members have a duty to report instances in which there is harm or a likelihood of serious physical harm to a vulnerable adult. When there is probable cause to show that an adult may be suffering from abuse or neglect, then the court may issue a warrant or injunction to stop any further abuse or neglect from occurring. It is necessary to get in touch with Missouri nursing home lawyers when you feel that the rights of a loved one have been violated under federal or state laws. Under federal laws, nursing home residents have rights such as the right to be fully informed, the right to participate in one’s own care, the right to make independent choices, the right to privacy and confidentiality, the right to dignity and respect, right to complain, right to security of one’s possessions and right to be free from abuse, exploitation or neglect. Specifically, residents have the right to refuse medication or certain treatments. 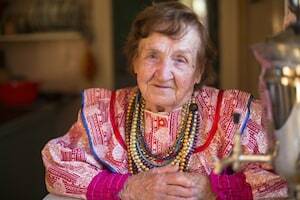 Nursing homes must honor the requests that residents have to be taken off of medications. If a resident believes that a drug is functioning as a chemical restraint, then nursing homes must end the administration of this drug. Family members who notice that a nursing home is not respecting the wishes of a loved one should get in touch with a nursing home lawyer to receive additional help. A nursing home lawyer can ensure that a nursing home upholds the rights of a loved one or assist family members in filing a report with Missouri governmental authorities. Call one of our Missouri nursing home lawyers to schedule an initial consultation today. Your loved one deserves to receive the utmost care. 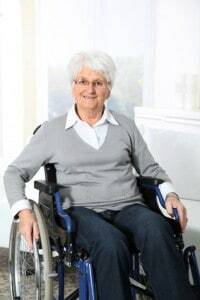 Nursing homes are given the legal responsibility to routinely rotate patients bound in wheelchairs or bedridden at a minimum rate of one time every two hours. Readjusting the patient’s body can easily prevent a developing pressure sore. However, nursing facilities often fail in this responsibility when they are understaffed or using a workforce that lacks sufficient training to properly monitor each patient and take appropriate proven steps to eliminate the potential of bedsores. Patients living in nursing homes tend to be highly susceptible to acquiring a bedsore while at the facility. This is unfortunate, because nursing homes are required to follow proven protocols of turning or readjusting the body of every mobility-challenged patient. In addition, the staff is required to monitor every patient’s skin routinely to look for any early signs of a developing pressure sore. Successful bedsore-preventing protocols require the staff to check the patient’s skin at the start of every shift around-the-clock. At the first sign of a facility-acquired bedsore, the staff is required to take appropriate action to ensure that all pressure is alleviated from the area, and that proper treatment commences. Treating the area properly in the early stage can ensure the sore does not progress to an advanced stage. Stage I – Detection of a developing pressure ulcer is simple in its initial stage when blisters or red spots appear on the body, and the affected area feels softer or firmer than the surrounding skin. Stage II – Typically, at Stage II the sore becomes an open wound forming a blister, shallow crater, or shows signs of scrapes or abrasions. Stage III – A deepening crater appears at stage III exposing fatty deposits below the skin surface. Stage IV – This serious final stage usually reveals extensive damage were muscle or bone is exposed at the bottom of a deep crater. Life-threatening sepsis (blood) and/or osteomyelitis (bone) infection can occur if the pressure sore is allowed to progress to Stage III or Stage IV. Your loved one should not have to suffer at the hands of an understaffed nursing facility. This is because the staff has a legal obligation to provide your loved one the best medical care possible, using recognized protocols, procedures and standards of care. When they fail in that responsibility, it is essential that you hold them accountable for their negligence and stop the careless acts that are compromising your loved one’s health. Fill in the form here to make contact with the skilled reputable Mississippi pressure sore lawyers listed below. They offer you an initial free no obligation consultation to discuss legal options at stopping the neglect now. Additionally, the lawyer can file a claim or lawsuit on your behalf to obtain financial compensation for the damages endured. 5 years. (Mo. Ann. Stat. §516.120) general negligence.